Like Park Yeonghun 9d in League B, Kang Dongyun 9P remains undefeated in League A of the 38th Myeongin. 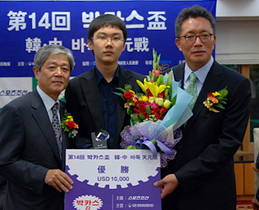 He defeated Baek Hongsuk 7d by resignation on July 15, which eliminates Hongsuk from a spot in the Myeongin semifinals. Dongyun, however, is facing a significant obstacle in maintaining his undefeated league record: his next opponent is Lee Sedol, who is in a must-win situation if he expects to make it into the semifinals. Sedol currently stands at two wins and one loss in league play and will face Kang Dongyun and Lee Changho in his final two games. At this stage in the tournament, there are four remaining players competing for two semifinal spots in League A: Lee Changho 9P, Lee Sedol 9P, Kang Dongyun 9P, and An Kukhyun 2P. Park Yeonghun 9P is moving toward accomplishing an undefeated record in League B of the 38th Myeongin. Yeonghun has won all three of his league games so far, notching his latest win against Won Sungjin 8P. He has two league games left to play, one against Cho Hanseung 9P and the other against Kim Kiyoung 5P. Yeonghun is currently ranked #4 among Korean professionals, with Cho Hanseung ranked #6 just behind Choi Cheolhan at #5. 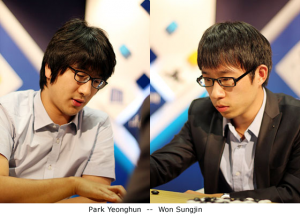 A victory against Hanseung would give Yeonghun a solid base going into the Myeongin finals. Park Yeonghun faces Cho Hanseung on August 9th. 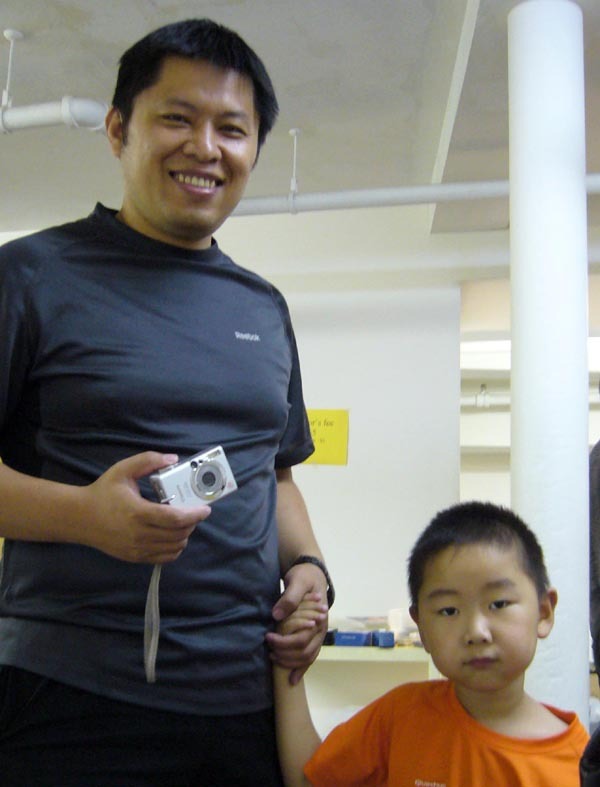 COTSEN TOURNEY SET FOR SEPTEMBER 18-19 IN L.A.
Park Junghwan 8P won the 14th China-Korea Tengen Tuesday, defeating Chen Yaoye 9P by 1.5 points in the final round. This is Park Junghwan’s first C-K Tengen title win and the eighth time Korea has held the title. Chen Yaoye won the title last year, giving China six title wins. 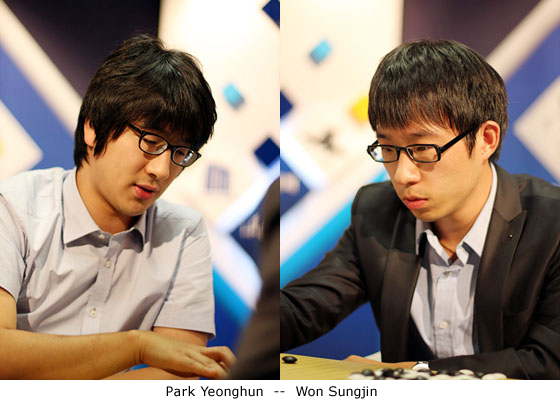 Park Junghwan 8d (r) defeated Chen Yaoye 9d (l) by 2.5 points in the second round of the 14th China-Korea Tengen on Monday, July 12. The series is now tied at 1-1; the final game will be played on July 13th. 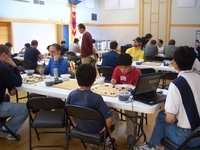 Phil Waldron 6d (r) won the 2010 GO for All Game Summit Open tournament, which drew a diverse field of players triple the size of last year’s event. The event – held amid a gaming convention — was held in Ottawa, Canada on June 13. 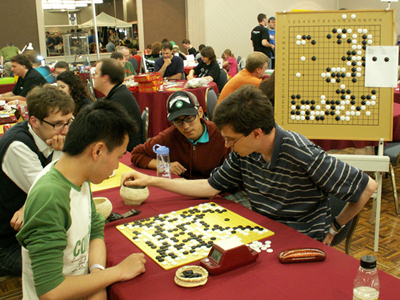 Waldron withstood fierce challenges from “Summer” Xià 5d of China – who took second place — along with Howard Chang 4d (3rd place), Grigory Poselentsev, a 2-dan from Russia, and Benson Lai 2-dan. Slate & Shell Publishing sponsored the event and provided prizes. 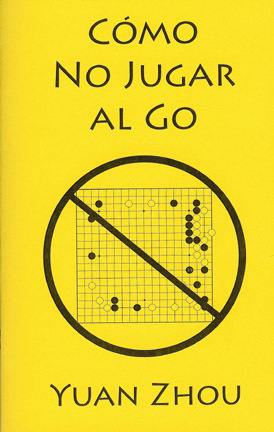 “After studying the texts, the competition is sure to be even more fierce next year!” reports Tyler Reynolds of GO for All and Vice-President of the Canadian Go Association (Grants & Youth). In the first game of the 14th China-Korea Tengen match, China’s Chen Yaoye 9P defeated Korea’s Park Junghwan 8P by resignation earlier today. The Tengen is an annual best-of-three match between the respective winners of the Chinese Tianyuan and Korean Chunwon tournaments. The second game will be played on July 12th.